A lot of attention is paid to West Harlem, or what many people traditionally consider THE Harlem, thanks to its rich history rooted in places like the Apollo and up-and-coming hot spots like the Studio Museum in Harlem and Marcus Samuelson’s renowned restaurant, the Red Rooster. 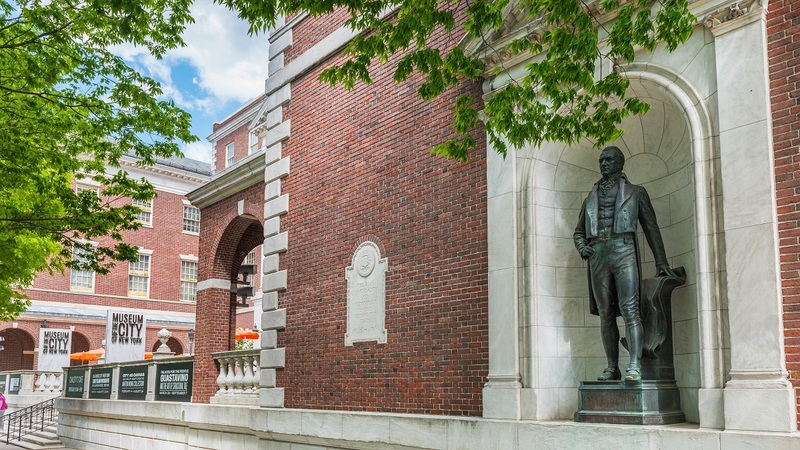 But east of Fifth Avenue, there’s a history just as deep, and the neighborhood is at that fragile stage where it could easily be thrust into a wave of gentrification at any time. 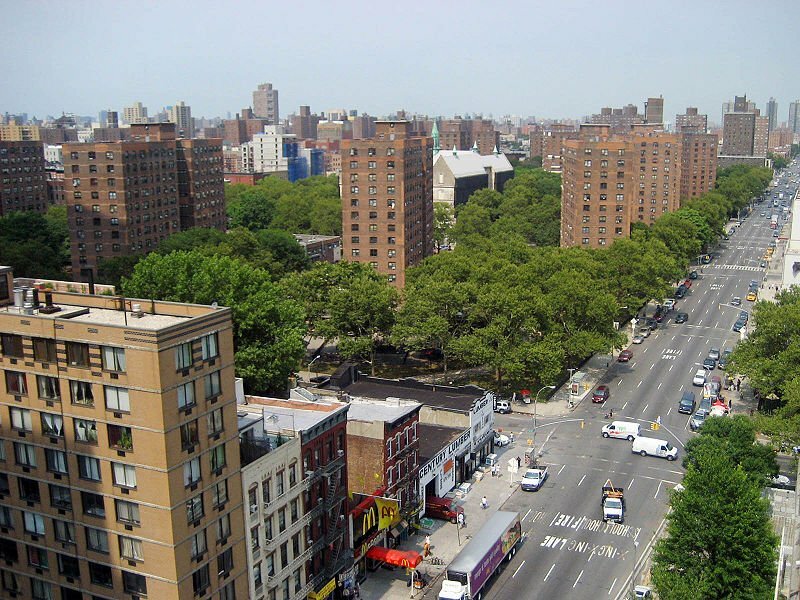 Defined as the area bound by Fifth Avenue and First Avenue from 96th to 125th Streets, East Harlem is commonly known as Spanish Harlem, or El Barrio by locals. What many people unfamiliar with the neighborhood don’t know, though, is that this area got its start as Manhattan’s first Little Italy. And if you’re the type of New Yorker who doesn’t venture above 86th Street, you’re likely unaware of the slew of new developments sprouting up in East Harlem thanks to a 2003 57-block rezoning. East Harlem was settled in the late 19th century, quickly followed by an influx of Italian immigrants when transit lines connected the neighborhood. Southern Italians and Sicilians were the main groups to move into the area that became known as Italian Harlem and was the first part of Manhattan to be referred to as Little Italy. It was where the Genovese crime family was founded, one of the Five Families of organized crime in New York City. By the 1930s, over 100,000 Italian-Americans lived in the crowded tenement buildings of East Harlem, three times that of the Lower East Side’s Little Italy. Today, only Pleasant Avenue remains an Italian community, but each year the residents host the Feast of Our Lady of Mount Carmel, this location being the first Italian parish in New York City, and the “Dancing of the Giglio,” the first Italian feast celebrated in New York. After World War I, Latino Americans and Puerto Ricans started to move to the area around 110th Street and Lexington Avenue, which was the original Spanish Harlem enclave. Following the second World War, even more Spanish-speakers moved in as Italians moved out, and all of East Harlem became known as Spanish Harlem. By 1950, Puerto Rican immigrants were the dominant group, their population reaching 63,000. 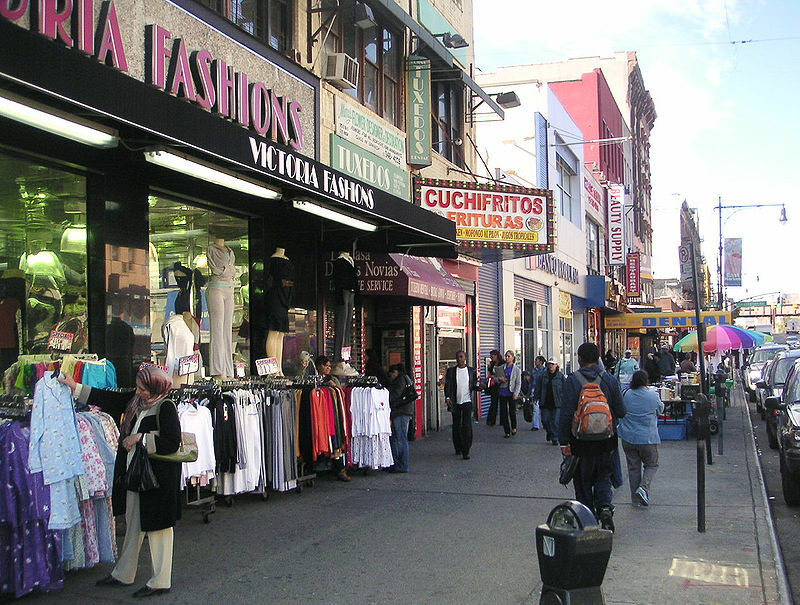 El Barrio became a secondary moniker for the community, which translates to “the neighborhood,” and bodegas, botánicas (stores selling herbal remedies, religious candles, incense, etc. ), and storefront Catholic and evangelistic Protestant churches started popping up everywhere. It was also following WWI that elegant apartment buildings started to sprout up in the lower portion of East Harlem. In 1924, the 15-story 1158 Fifth Avenue opened on the southeast corner of 97th Street, boasting one of the most elegant lobbies in the city. 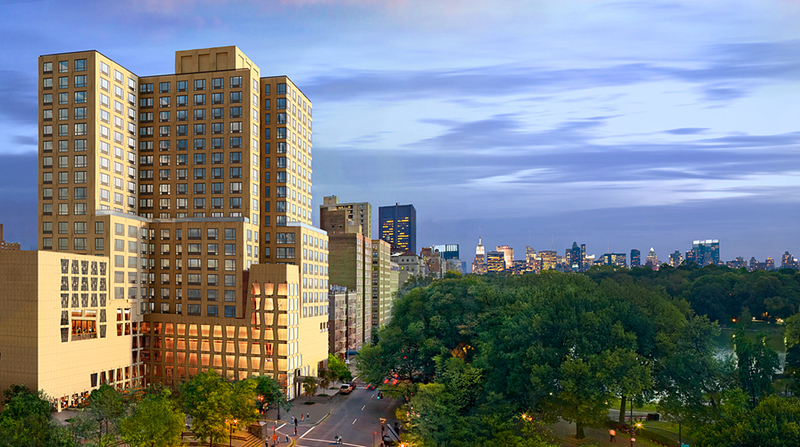 Four years later, the Emory Roth-designed, 16-story 1200 Fifth Avenue rose on the northeast corner of 101st Street near Central Park West’s Conservatory Gardens. Beginning in the ’50s, though, East Harlem entered a period of decline, as urban renewal projects transformed the neighborhood. The deficits, gang violence, widespread drug use and crime of New York in the ’60s and ’70s didn’t help either. But the community remained resilient. In 1970, artist and educator Raphael Montañez Ortiz founded El Museo del Barrio to fill the void of Latino art in mainstream museums. The institution remains an anchor of Spanish Harlem, both serving as a place of heritage for Puerto Rican and Latino residents, as well as a destination to educate and entertain tourists and other New Yorkers unfamiliar with the northern area. Another major landmark in the community is the Museum of the City of New York, located on the block of Fifth Avenue between 103rd and 104th Streets. Founded in 1923, it was originally housed in Gracie Mansion, but in 1932 took up residence in the grand Georgian Colonial-Revival structure where it still resides today. In 2013, the museum reopened after a seven-year, $80 million renovation and expansion, perfectly timed with the neighborhood’s resurgence. Over the past ten years, average sales prices in the neighborhood have nearly doubled, from $476,090 in 2005 to $885,099 this year. The jump, which really spiked in 2009, can be mostly attributed to condo sales, rising from an average of $481,593 to $1,106,086 in the past decade. But what really set things in motion was the 2003 rezoning that was spearheaded by the Bloomberg administration’s City Planning chair Amanda Burden. It was the first revision in 40 years. Covering a whopping 57 blocks, it “increased density allowances along First, Second, and Third Avenues, while preserving the human-scaled midblocks in between. Over the past decade, more than a dozen residential mid-rises, roughly 8-12 stories, have blossomed along the area’s wide, well-trafficked corridors,” as we reported last week. Moving closer to the park, other high-end buildings are also on the rise. In 2011, the large, bulky, mixed-use Robert A.M. Stern-designed building known as One Museum Mile opened. It has 116 condos, and on the ground floor is a cultural space for the Museum of African Art. The neighborhood’s original stock of luxury housing is also taking on a new life. 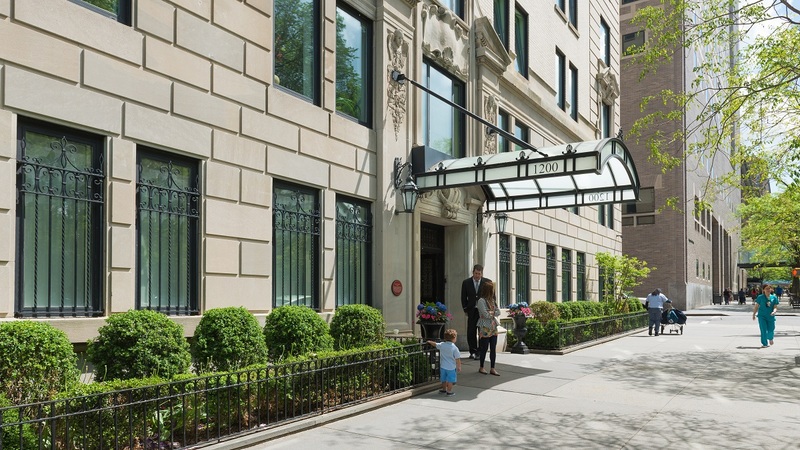 For example, 1200 Fifth Avenue was converted in 2004 to 63 condominium apartments, which today are fetching prices close to the $10 million mark. 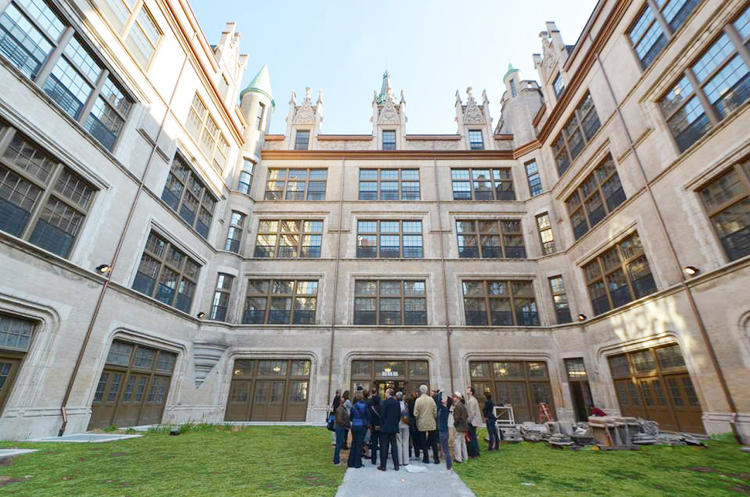 A major development in East Harlem is El Barrio’s Artspace PS109, a former abandoned public school building transformed into 89 units of affordable live/work housing for artists and their families, as well as 10,000 square feet of complementary space for arts organizations. As we noted back in December, “A whopping 53,000 creatives applied to live in the building, where studios will rent for as low as $494/month and two-bedroom units will go for $1,022/month.” Since it’s well known that the first inkling of gentrification in a neighborhood is usually the influx of artists, many worry that this project will change the makeup of East Harlem. However, PS109 says it’s saving “the cultural fabric of a small corner of Manhattan that’s starting to change quickly” by preserving its affordable housing. Either way, PS109 will not be the sole determining factor in East Harlem’s future. Though real estate prices are on the rise, the neighborhood is still significantly more affordable than most other parts of Manhattan. And there are plenty of diverse restaurants, quirky stores, and local attractions to attract a younger, up-and-coming crowd. What’s great about these offerings, though, is that they’re a mix of old and new, catering to both nostalgia lovers and those looking for the latest hot spot. Take for instance the Urban Garden Center, the 20,000-square-foot outdoor garden center on 116th that has been handed down over three generations; La Casa Azul Bookstore, which sells unique art and books and participates in culturally-based programs that celebrate Latino traditions and literature; and Casina Latina Music Shop that has been selling Latin music, instruments and hard-to-find collectibles for over 30 years. On the other side of the spectrum is the massive East River Plaza complex on 117th and the FDR. Opened in 2010, the shopping center hosts affordable big-box stores like Target, Costco, and Bob’s Furniture. New restaurants with a downtown vibe are beginning to pop up. D’Amore Winebar is a cozy café with Italian tapas; Lexington Social is another spirits and tapas bar with all the usual suspects (fancy mac n’ cheese, truffle fries, Brussels sprout salad) you’d expect to find in the latest haunt in Williamsburg; and East Harlem Café hosts gallery shows and displays local art. And since certain reports attribute yoga studios to hipster-fication, we should note that East Harlem has several, including a Bikram Yoga studio. The authentic and historic establishments are still thriving, though. Rao’s opened in 1896 on East 114th Street, serving southern Italian specialties. It remains so popular today that diners wait up to a year for a reservation at the 10-table spot. 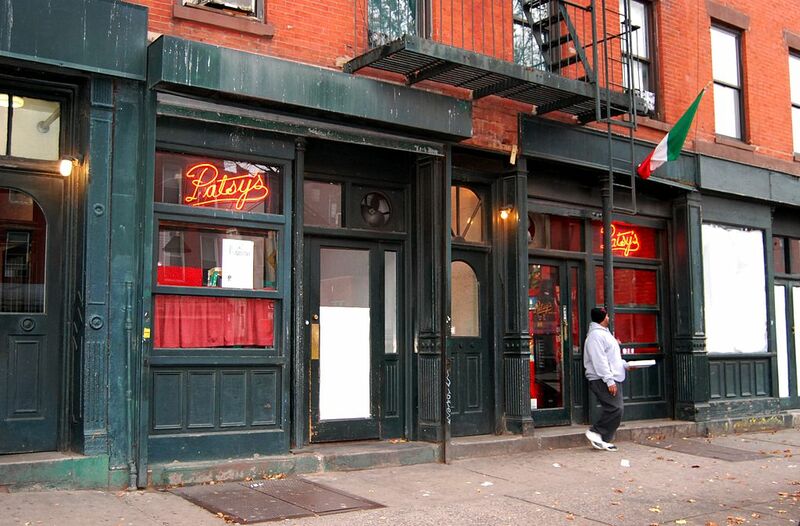 On the more casual end, Patsy’s Pizzeria (the original) starting serving up slices in 1933 and is still packed on any given night with people from all walks of life. In the mood for authentic Spanish or Latino food? 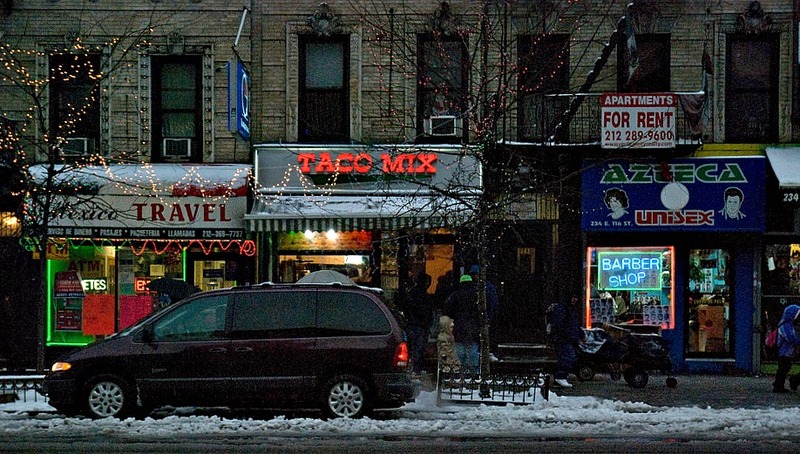 There are plenty of small bodegas with taco stands, Mexican restaurants like the popular Taco Mix, or Camaradas, a Puerto Rican pub with live music and dancing. What do you think is next for East Harlem?